You might think you are looking at an ice cave in some remote location, or the interior of a living organism. 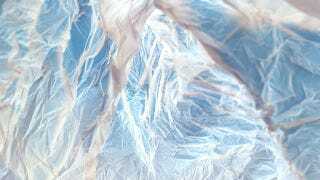 But these photographs by Vilde Rolfsen are actually of something you may encounter every single day—the plastic bag. Rolfsen uses bags found on the street and sculpts them with the aid of tinted lights and cardboard backdrops. What's amazing is the diversity of things Rolfsen's images can evoke. When I look at them they seem spooky, corporeal, natural, and magical from one image to the next. That's what makes them great!